Hello, Space Freaks. In mid November 2017 we witnessed the first of several major auctions that encompass one of the best Vintage Star Wars collections to ever be put on the auction block. With incredible results across the board, the first round Hake’s Americana auction of the Russell Branton collection certainly was an interesting event and worth reviewing in detail. Before we look at the auctions themselves, we should talk a little bit about traditional live auctions, online auctions, and how Hake’s Americana has an unusual but effective approach that differs from both. In a live auction setting, items don’t have a set start and end time. There is an order of the items going up on the auction block and the hammer is struck once no bids remain. In a traditional online only auction, an item has a set start and end time in which bidders can bid, thus an auction that ends at 8:00 will not be taking bids at 8:01. Simple, I know, but I want to make sure that we’re all on the same page here. Hake’s approach is different and captures some of the good and the bad of both worlds. Much like an online auction, all of the items have a start and an end time. However, much like a live auction, if a bidder makes a bid it can extend the length of the auction, thus pushing the hammer out further as more people bid. This is a novel concept in that key items can go hours and hours past the listed end time of the auctions as long as people keep bidding. I’m sure this can create frustration for those bidding if their items keep getting pushed out, however for spectators it creates a spectacle and allows everyone to see more of the detailed bidding behavior. The goal here like any business is to make money, and in the end that’s what it does. By allowing the most sought after items to continually go up in price, you give bidders the chance to opt in and rethink their high bids -- and not over the course of seconds, but over the course of hours. This leads to some exciting action among bidding and really changes the game when it comes to strategy in an auction setting. Rather, we’ll take a look at some of the key items from the event and discuss the implications of one particular auction in detail. With that, let’s look at the items themselves. Ben Kenobi Double Telescoping MOC – $76,700 – The crème de la crème of the auction was the first of three MOC double telescoping figures that will be auctioned off across the series of auctions. With examples selling for six figures in the past year, this actually wasn’t the biggest head-turner of the event from a results perspective. It was however the highest priced item at the end of the auction and a great item to see in an environment like this, as most of these aren’t sold through public auctions or eBay, but rather through high end dealers and collectors. Needless to say, having a MOC DT of Ben is an incredible sight, rarely seen, very sought after, and ultimately extremely valuable in the world of Star Wars toys. 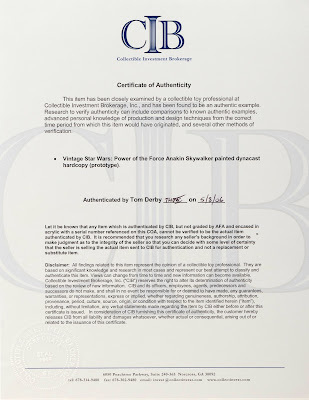 Anakin Skywalker Dynacast Painted Charcoal Gray Hardcopy – $34,981.10 – Not to be confused with its more common first shot counterpart, this painted dynacast hardcopy is the envy of many prototype collectors. The price seems to be a bit high, but then again its rarity and desirability make it a unique piece especially in the “up” market that we’re seeing in the pre-production realm. 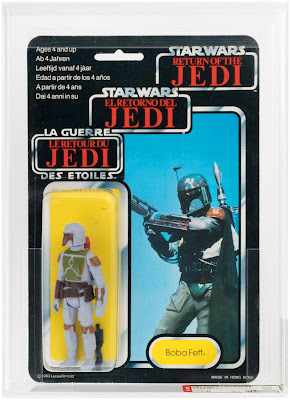 Boba Fett AFA80 Trilogo MOC – $11,682 – We can’t say enough about how cool of a piece this is. 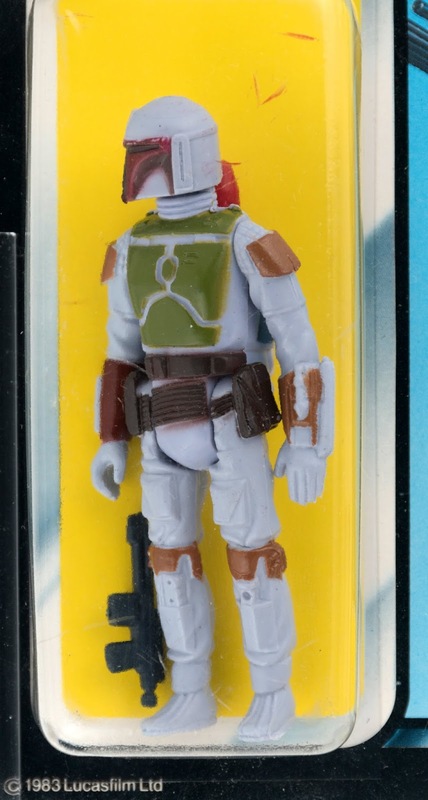 Its Trilogo, it has an unpainted knee, and it’s Fett -- all things that lead to appreciation in value and high prices. A beautiful piece in incredible condition with a price tag that would choke a goat, it was great to see this reach a high mark. 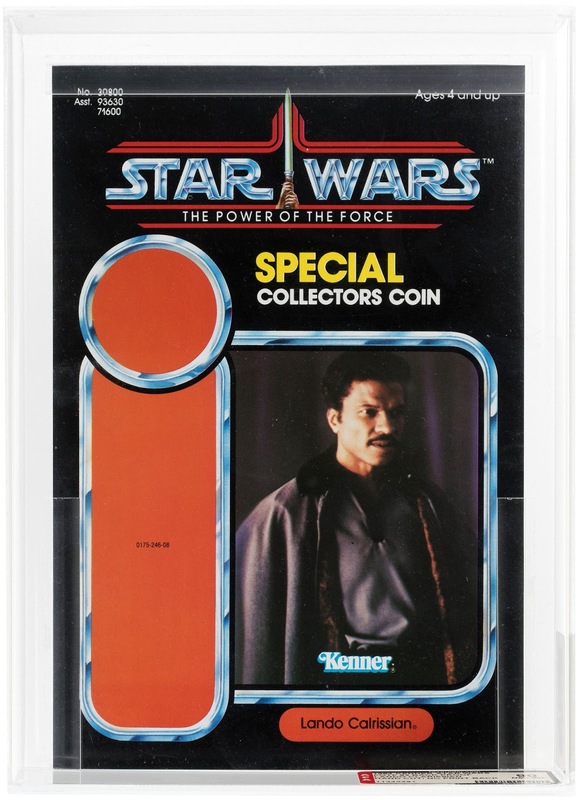 Lando Calrissian POTF Hand-Cut Proof Card AFA90 – $5,717.69 – Given its rarity, this may have been one of the best “deals” of the day if there were any deals to be had. A cut card from the POTF line with no backer printed on it, it may not be one-of-a-kind but it can’t be far from it. 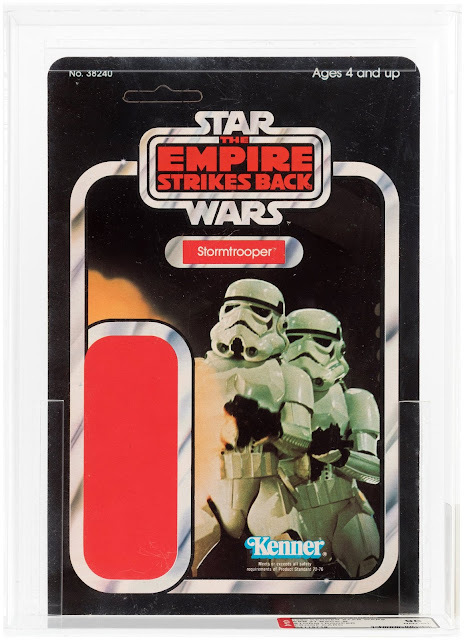 Stormtrooper ESB 31-Back Proof Card AFA90 – $8,047.60 – Although you can buy them in droves as loose figures, when it comes to pre-production, Stormtrooper proofs can be some of the rarest and most expensive. In the ROTJ line the 65A which is the most common proof with a few examples of each character in existence, the Stormtrooper is one of two that only have 2-3 examples known. When you look at the rarity of the 31-Back proofs, this piece along with a few other characters fits into a class all its own in terms of scarcity and demand, thus it was no surprise that this went for big money. 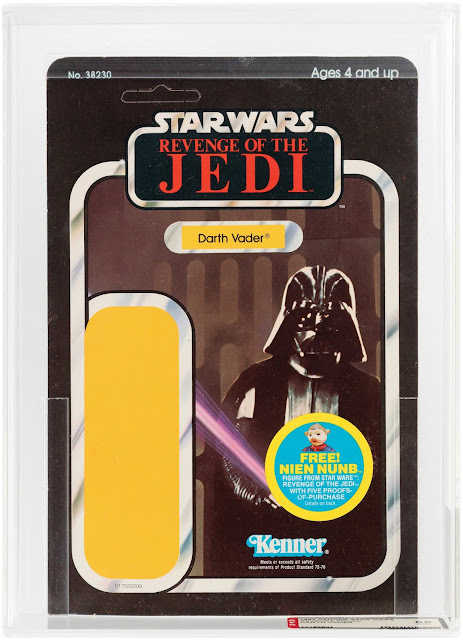 Darth Vader Revenge of the Jedi Proof Card AFA85 – $4,283.40 – With a strong ending price, this Revenge Vader proof is one item that continues to go up and up in value over time, in this case passing recent auctions for Boba Fett Revenge proofs in terms of the final price. 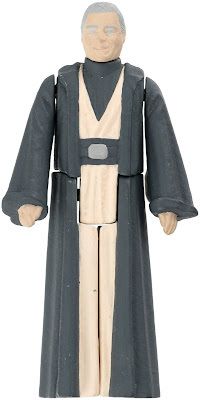 The Dark Lord of the Sith is one of the most recognizable characters in all of cinema and in the past few years the piece has really risen in value. 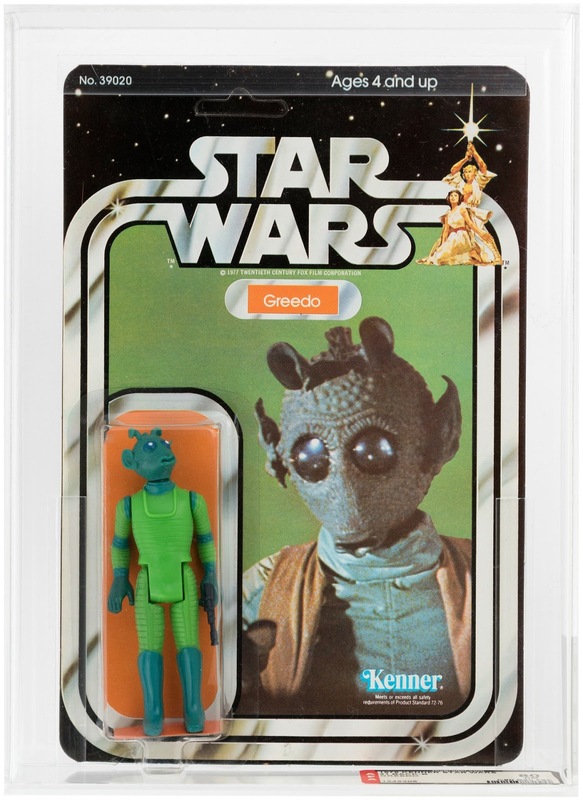 Greedo AFA80 21-Back – $1,535 – Kind of crazy, as when you put in the buyer’s premium someone could have bought three of these for the same price on eBay in a given month. 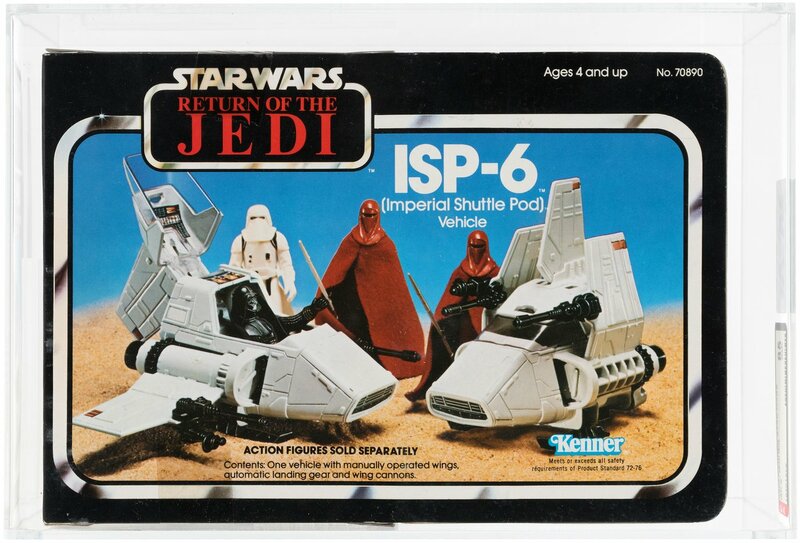 ISP-6 Mini-Rig AFA85 – $1,534 – For years I’ve been telling people in the hobby that the ROTJ line is the superior line of the Star Wars series and finally I have proof (J/K). Here I think we have the case of someone struggling to find the grade they wanted and throwing out a crazy number thinking no one will actually bid this up. Then again, MOC Boushh figures have sold for nearly $2K in the past few years, so maybe ROTJ mini-rigs are the next big thing. 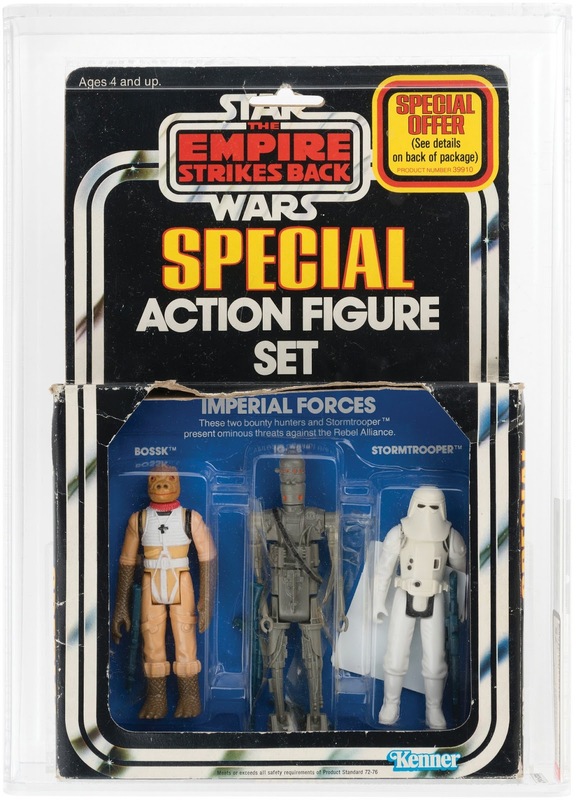 Imperial Forces AFA75 Action Figure 3-Pack – $17,133 – With all the buzz surrounding this series of auctions, two things seem to be talked about more then anything. First, the fact that examples of all three DT MOC figures will be up for grabs. Second, that an entire set of 3-packs will be up for grabs. Given the latter, I think we have a case of someone really needing to complete a full run as the price here is absurd! Now this is one of the most popular of the 3-packs, but it’s not one of the rarest, and in 75 condition it’s not that great overall. Thus, it’s easy to say that this went way above its actual value; more so than the ISP-6, but not as much as the auction we have yet to discuss. To close up, let’s look at the auction that has caused so much commotion on social media. Let’s look at the craziest of the crazy, the auction that produced a number that is way out in left field on that thin border that separates the world of the norm from the world of the extreme. Of course, I’m talking about a term we’ve come to use many times on the MarketWatch over the years: the lunatic fringe. 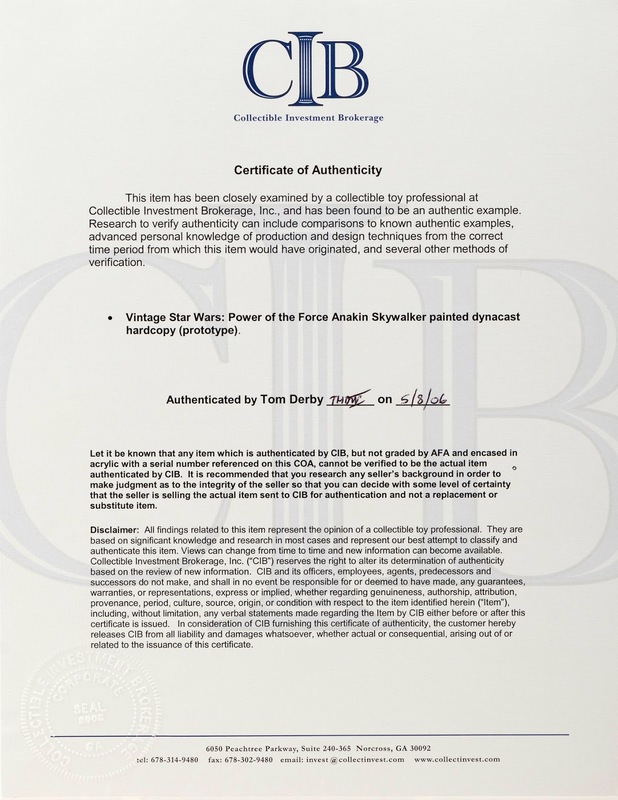 Luke Skywalker AFA95 12-Back – $50,622 – The result of this auction poses an interesting question: “What will someone pay for the best condition example of the most iconic Star Wars toy of all time?” The answer is a boatload. I mean that in a literal sense, as you could literally buy a boat and fill it with cash for what someone dropped here. 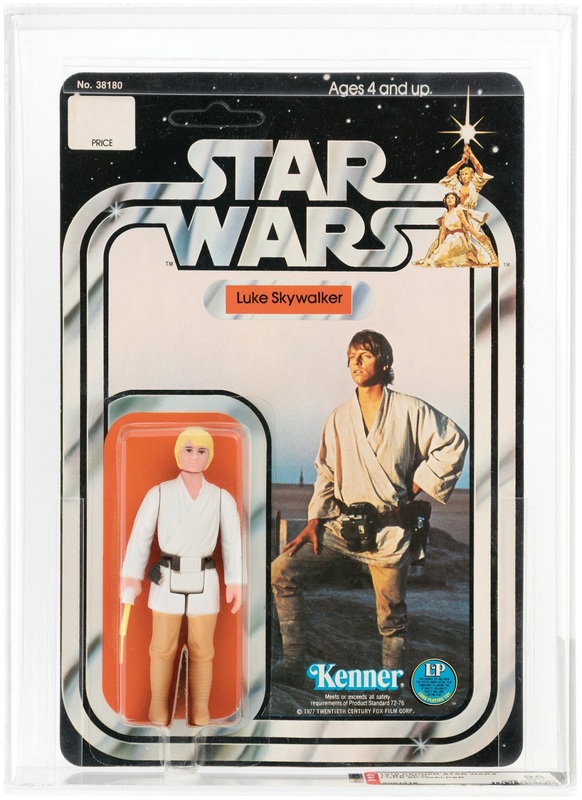 It’s hard to argue against the notion that the most desirable of all of the original Star Wars toys was Luke Skywalker. He’s the main hero of the movie. His surname and its lineage became the link that will connect 9 movies in the franchise together. And although Vader is probably the most recognizable figure in the Trilogy, Luke was the focal point of the first three movies and his struggle is still regarded by many to be the key thread that pulls the Skywalker saga together. I can’t say it’s with no surprise that we saw this piece reach astronomical levels. In fact, without getting into the details I have to say the number is crazy for any long time collector. But let’s look at some of the underlying implications, both with the results and what this could mean for the future of these auctions and the hobby as whole. Taking that point into the equation, let’s take a minute to focus on the condition. Needless to say, there isn’t a lot of transactional data around AFA sales above the grade of 90, and of what is out there most are loose figures and proofs. Given this lack of specific data, honing in on similar auctions is difficult, if not impossible. However, there was one example that I was able to pull from this past year. In order to go deeper than this, we move to the next best thing available to us in terms of comparative information from other AFA95 auctions and data from other high grade auctions. Earlier this summer some eyes rolled when an AFA95 Yoda sold on eBay for $1,981 -- a figure that that traditionally sells for $4-$500 in AFA80 condition. This gives us a good baseline for the Luke figure in question. This Luke example is a 12C-Back figure and an AFA80 condition usually sells in the $1,500-$2,000 range. Taking the high end of that estimate, we find that our AFA95 brought a 25X lift over its AFA80 brethren. Quite the stretch as we only saw a 4X lift on the Yoda figure. Similarly, this summer we also saw an AFA95 Chewbacca 45-Back proof card sell for just over $2K. Given that 90 grade proofs are more attainable (comparatively speaking), we assume that the increase here wouldn’t be that much. In fact, in the past year we’ve actually seen AFA90 examples of a Chewbacca 45-Back proof sell for more than what we saw with the auction for the 95. The elasticity of price with items that are clustered around a specific grade such as proof cards has historically lead to only marginally higher prices achieved for those pieces. Thus, an AFA 80, 85, and 90 proof card of the same character and type may only have a 20-30% difference between the 80 and 90 examples. On the inverse, the spread on a MOC figure is much higher with a sometimes 50-100% difference between those same grades. In short, the elasticity of price relative to the type of collectible varies dramatically, and in the world of Star Wars, MOCs do traditionally have the widest spread. The aforementioned Chewbacca proof auction illustrates a point in lack of variance in price, however there’s another underlying implication that we can look at when it comes to these results, and it’s a point that a lot of collectors miss: it’s not just about the price and condition, sometimes it’s about the forum. In the case of the AFA95 Chewbacca proof, the item was sold on eBay, while the 90 proof that sold for nearly twice as much sold at Celebration. Thus, the biggest difference was the selling environment. It changes the customer’s mindset, and it potentially brings new buyers to the table by creating a different sense of urgency. In the case of the $50K Luke Skywalker, I have to believe that the forum had a profound impact on the end result. With all of this in mind, I return to the question I posed at the beginning of the discussion on this piece: how much is the best condition example of the most recognizable/iconic figure in the line truly worth, and what is someone willing to pay for it? Well, it’s going to vary...I know that’s not the answer a lot of you want to hear, but the fact of the matter is there are so many factors that play into an auction price that it’s almost impossible to point a finger at one number. Rather, we have to look at all of the factors in this situation playing together to create the perfect storm that produced a historic high and should be seen as a win in the hobby no matter what your opinion is on the actual results. That’s all for this round, check back in a January for our year-end round up! Klaatu receives the dubious and unfortunate honor of being the last figure covered with Skye's broken microphone in this quick and dirty episode (it's okay, we'll get him back with a Klaatu Skiff episode in a year or so). We talk about the history of Klaatu's original name Wooof and propose an alternative future for the figure should he have maintained this moniker. Then we interview our Instantgram "Grammy Daddy" Anthony Spinnickie as our new contributor and our Space Freak of the Week. Then we discuss the Nugget from the Archive, a hardcopy which leads to a discussion of internal Kenner memos on the heights of figures, a peculiar shipping case and a Canadian catalogue. The Unloved Item is the much-loved Sigma figure, which as it turns out is the Sympathetic Male Stripper variant. All this and less on the 86th 'Vintage Pod! 44:27 – Nugget from the Archive: Klaatu Hardcopy and more Wooof notes. Disneyland's Star Trader gift shop, where it all began. When one considers the tens of thousands of Star Wars related photographs out there, some of the hardest to find are shots of old merchandise on store shelves. Especially in the age before digital cameras and phone selfies, it just wasn't a regular thing. Someone might inadvertently capture some toys in the background of a family picture, but very few people deliberately take photographs inside a store. In this case though, someone was paid to do that very thing. When Star Tours opened in 1986, it featured something that few had ever seen before. No, not just the groundbreaking technology or a Disney attraction using (at that time) non-Disney characters, it featured a theme park attraction which exited directly into a gift shop. Disney had toyed with the notion over the years, recognizing that routing guests past merchandising areas increased sales, but it was almost always a passive thing. A cart selling Haunted Mansion-themed "invisible dog leashes" in front of the entrance to the ride, or a counter which sold pirate themed jewelry near the exit of Pirates of the Caribbean, for example. With Star Tours though, Disney had the space and the willingness to turn passive subliminal marketing into a full-fledged SUPERliminal push. If you wanted to ride the newest attraction in the park, you'd have to literally walk through Disney's store to get back out. Star Tours is really the first ride where we see this idea put into action, and it was so successful that it's since become fairly commonplace in the entire theme park industry. So common, in fact, that Disney duplicated the "exit through/near the gift shop" layout when the Star Tours ride was cloned in Tokyo Disneyland in 1989. Or as close as they could anyway, even if it involved putting in a glass 2nd story walkway to get guests from the exit of the ride to the area of the gift shop. However groundbreaking (or annoying) the hard-sell opportunity was, Disney wasn't alone in this deal. Because the ride was a partnership, Disney needed to keep Lucasfilm informed about the status of the ride and ensure that certain maintenance and upkeep standards were met. Given that LFL was dealing with Disney (as well as Disney's partner in Tokyo Disneyland, The Oriental Land Company), this was merely a formality. Still, periodically, someone would need to go to Disney and take pictures of how things looked. What was Disney doing with LFL's intellectual property? Were the retail spaces well maintained? Were the products displayed in a way which would inspire someone to purchase them (thus ensuing that LFL got its cut of the profits)? That's where these photos come in. 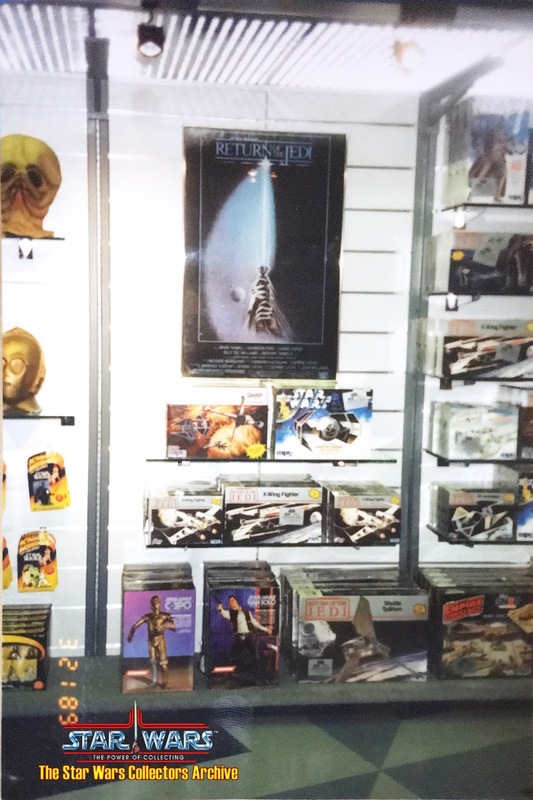 What you're looking at are internal Lucasfilm Licensing shots, taken inside the Cosmic Encounters store at Tokyo Disneyland. They are LFL's way of keeping track of their partner in the Star Tours ride and ensuring that the retail space is being used correctly. Although the shots are undated (well, technically they are dated, but the 1989 date is clearly incorrect and was probably the result of a camera glitch), we can do a fairly good job of dating them just by looking at what's actually for sale in the store. I think we're looking at a time-frame of late 1994 / early 1995, which would only be about 5 years after Tokyo Disneyland's Star Tours opened. 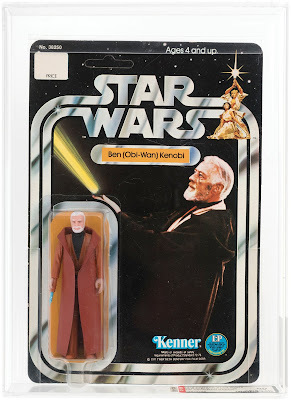 While that wouldn't classify them as "vintage," they still provide us an interesting view of Star Wars products available in the Dark Times before Hasbro's POTF2 toys were released. And for the Disney fans out there, these are some of the only shots of the shop you'll ever see without any guests. In this shot, we can see Kenner's then fairly new Action Masters line and an assortment of model kits. 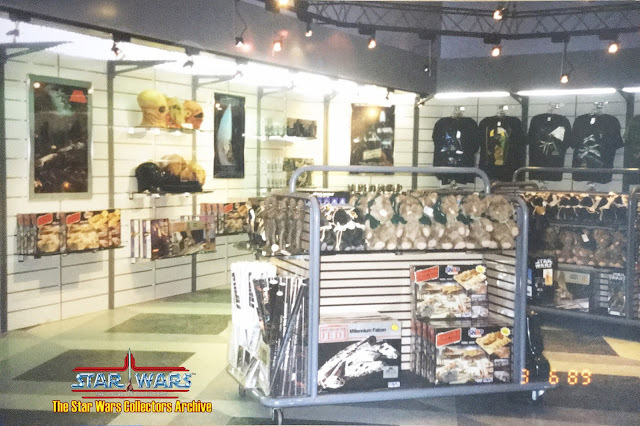 Here's a shot of the main cash register area of the store, showcasing a lot of Star Tours branded items: T-shirts, puzzles, keychains, and a plush Ewok. In the background on the right, you can see some unlicensed lightsaber-style role play toys. LFL apparently wasn't too concerned about their partner selling knock-off items like this, since there were no real licensed alternatives at the time. Although, Disney never really stopped selling this kind of thing in their parks, even after they purchased the Star Wars franchise. You can also spot an umbrella, which I assume was somehow Star Tours branded, and a child's shirt which appears to have an image and slogan related to Endor. I've never seen that shirt though, so I couldn't tell you what it says. 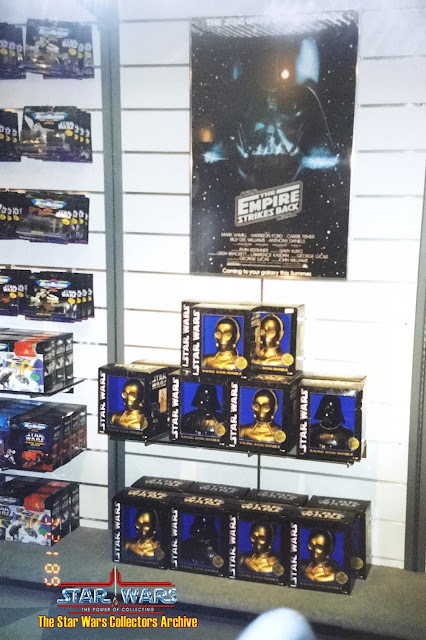 Since Star Wars merchandise was few and far between at the time, Disney had to fill its shelves anyway it could. 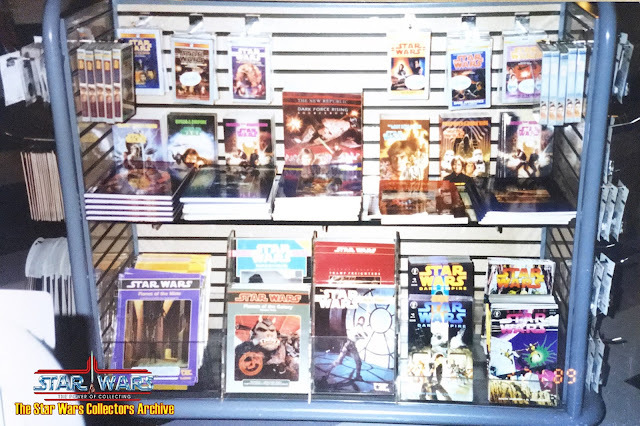 In this case, they have a whole display of expanded universe Star Wars novels and books on tape, issues of the Dark Horse Comics Dark Empire series, and some RPG source books from West End Games. As more Star Wars merchandise became available, Disney scaled back this kind of thing and replaced it with more impulse purchase items. It's odd to envision a time when you could go on the Jungle Cruise and then immediately walk over and purchase audio cassettes of the Heir to the Empire series. But at one time, you could. Of the photos, this one is probably my favorite. While it might be hard to make out if you're not familiar with Star Tours items, those little bins contain the ubiquitous Star Tours PVC figures: Chewbacca, R2, Wicket (from the Ewoks cartoon), Yoda, Vader, 3PO and Stormtrooper. Disney sold those little figures for YEARS. In the late 90s, when they finally stopping offering them, I remember seeing literal barrels of them for sale at Disney overstock dealers. They're still a really neat set to see complete though and they always make me smile. Below the PVC figures, we can see some Out of Character statues. They're essentially the same as the Applause figures released a few years later, which collectors might be more familiar with. We can also see some Star Tours branded mugs on the left, and some Return of the Jedi posters to the right. In the background, we can spot the then brand-new Star Wars Micro Machine sets from Galoob. Here's a wider angle shot of the store, showcasing plush Ewoks, more models, a bunch of t-shirt designs, and some masks. 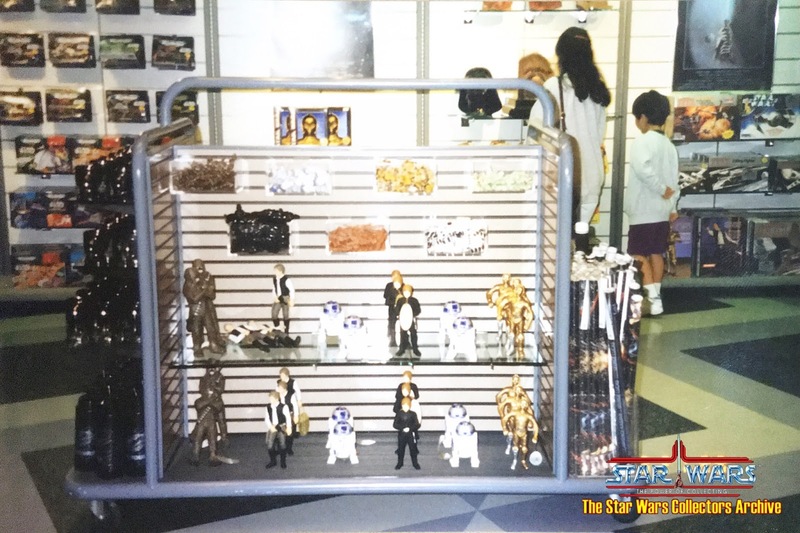 On the right of the display, we can spot what appears to be the familiar shape of Kenner's vintage Darth Vader carrying case. 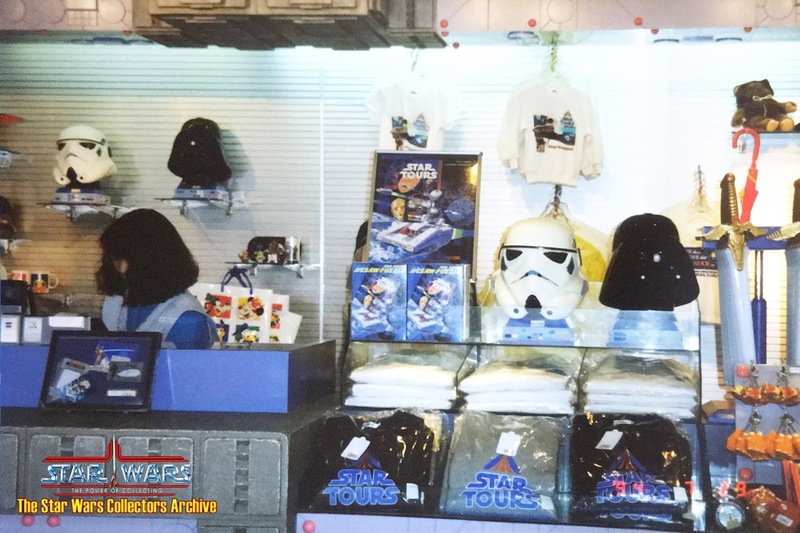 The Star Trader shop sold a lot of vintage merchandise in the early years, from Micro Collection overstock figures to Star Wars 10th Anniversary items. If I had to guess though, I'd say that this particular case might be from the Bendems release of the case, rather than the original Kenner version. But I'm not sure, since we can't see the front of the case in this pic. Our last image is of this display of 3PO and Vader banks, sitting below a reprint Empire Strikes Back Advance poster. To the left, we again get a little glimpse of some Micro Machines toys. You can see how new the line was when this photo was taken, because every one of their packages is in absolute mint condition. When you think about the sheer number of people walking through the Star Trader gift shop on a daily basis, you can imagine how quickly they ceased to be in such beautiful shape. So, there you have it. A half dozen photographs taken inside a theme park gift shop 23 years ago. But if you're a fan of Star Wars toy shop pictures or old photos of Disney stores, they're an invaluable glimpse of times gone by. 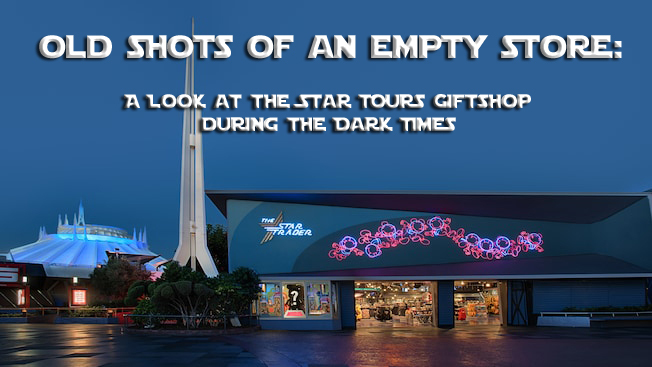 If you have any vintage shots taken inside the Star Trader shop or the Cosmic Encounters shop, feel free to post them!